At Mission Community Market, Zuckerman Family Farms is your go-to-spot for asparagus and potatoes. The farm, located in Stockton, is known best for their white potatoes. But summer weather has brought changes to the booth: the season of asparagus, a spring vegetable, is over, and this summer, blueberries have joined the Zuckerman table. “Every season something new comes through,” says Marvin, a seller for Zuckerman farms. This is his first year selling blueberries at Mission Mercado––in fact, as I speak with him, this is Marvin’s first day as a blueberry seller. The berries have a short season, and don’t come every year. Shoppers linger around the booth, dipping their hands into an open blueberry container to sample. 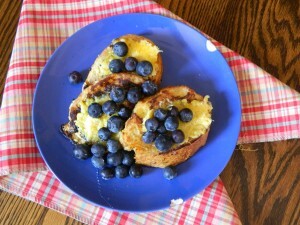 Marvin says that though the blueberries mostly go in oatmeals and muffins, the fruit is versatile. In fact, I can’t think of a berry more suited to a variety of cooking techniques––blueberries, while sweet, are relatively mild in flavor, and can be baked, grilled, pureed, or eaten raw. For that reason, blueberries are an effortless summer classic, ready to be packed in lunches, enjoyed during sunset porch–dinners, or floated in drinks. I explored two ways that blueberries could be prepared and paired with corn. Blueberries from Zuckerman farms are resilient and warm from the sun; the addition of fresh, locally produced blueberries is what makes the following recipes come to life. I encourage you to use berries from your local farmer’s market––the flavor in international bulk-produced fruit is just not the same. The full recipes appear after the jump! Slightly modified from Nothing But Delicious. Place kernels, cream and sugar in a sauce pan and heat over medium low for half an hour. Bring mixture to a gentle simmer for an additional 15 minutes, being careful not to boil. Pulse in a blender until there are no longer large chunks of corn. Pour through a fine mesh sieve to strain, or use a cheesecloth––I pushed as much of the puree as I could through the sieve with a wooden spoon, and then added milk to the left-over puree to blend and then sieve again. 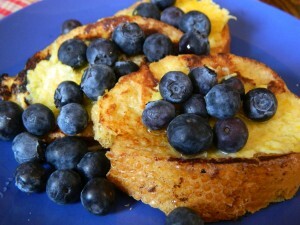 When all of the moisture is out of the corn puree, save it for another recipe (like the french toast below). Slowly stream mixture into egg yolks, whisking constantly. But be careful––this is a job for two (or more) people! I could not have finished this recipe without help. Preheat the oven to 300 degrees, then place ramekins in a baking dish with enough water to cover them half way. 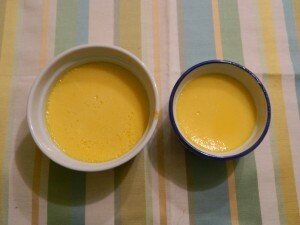 Pour cream mixture into ramekins and bake for 30-45 minutes, or until set. As you pour the cream mixture into the ramekins, be sure to scrape off any extra foam from the top of the mixture; if you leave the foam, the top of the pots de creme will have a warped surface. After baking, chill for at least an hour. In the meantime, combine lemon and honey in a small pot and bring to a simmer for 10 minutes. 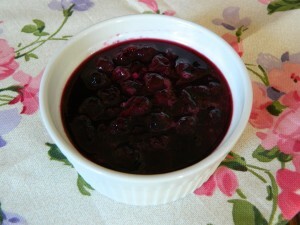 Add blueberries and simmer for another 10-15 minutes, or until berries are soft. 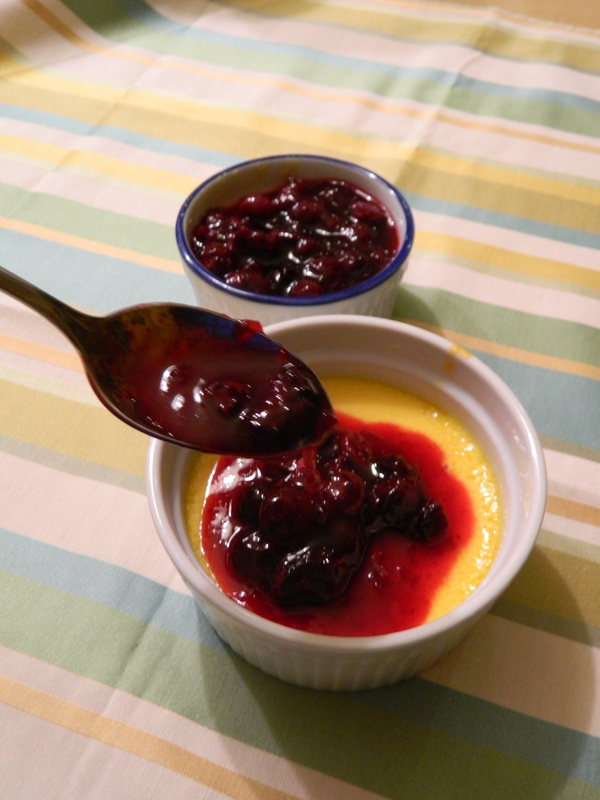 This compote was particularly sour (because, as I mentioned before, I am partial to sour deserts). I thought that the acidity of the fruit compote balanced the sweet corn creme well, but if you are squeamish around citrus, use less lemon and more honey or fruit. Warm a pan to medium-high, and butter it. The butter may brown, but should not bubble. In a medium-sized bowl, beat eggs until they are light yellow. Add the milk, spices, and vanilla, then whisk until combined. Soak slices, a few at a time, in the mixture. When soaked, the bread slices should be soft, but not drip. Grill slices, one side at a time, until lightly brown. Plate, smearing corn on top of each slice and then adding berries and drizzled honey.